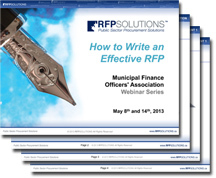 On May 8th and 14th, 2013, RFPSOLUTIONS provided Two (2) Live Webinars on the topic of How to Write an Effective RFP for municipal finance sector members of the Municipal Finance Officers’ Association (MFOA). This webinar was FREE to MFOA members and was recorded for future reference. Click Here to view the recorded Webinar on YouTube. In this webinar you will learn the major components and best practices needed to write an effective RFP. This information session promises to provide participants with a high-level understanding of the definition and development of an effective RFP. Segment 2: A Review of how effective Statements-of-Work (SOW) / Statements of Requirements (SOR) are developed. Segment 3: An analysis of how Bid Evaluation Criteria are developed, consistent with public sector-approved best practices and Tribunal/Court precedents. 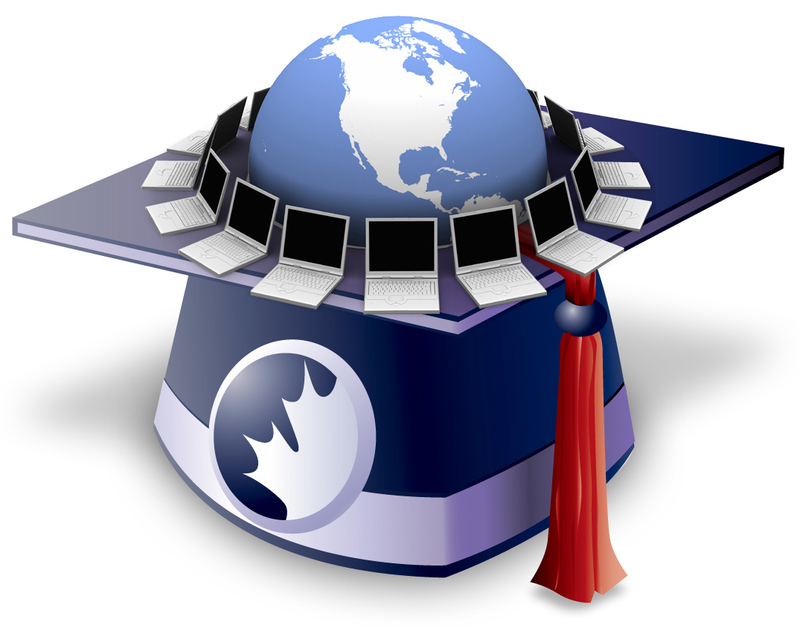 Including the development of evaluation tools and components such as the Basis of Selection. 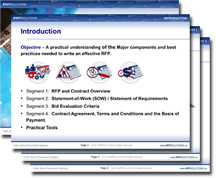 Segment 4: The fourth segment focuses on how the Procurement Strategy, SOW and Evaluation Criteria inform the end contract agreement, including other components such as the Terms and Conditions and the Basis of Payment. Practical Tools: You will be provided with take-home tools, examples and a questions and answers period that will help put things into perspective and assist you with procurement tasks long after the session is over.